Steve has been involved with amateur radio since he was at high school in England in the 1960s. 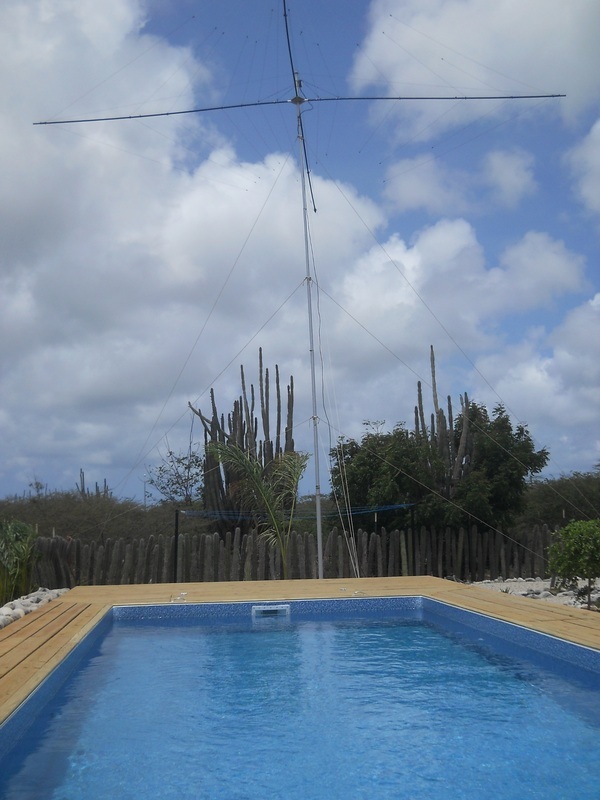 He now holds the callsign PJ4DX in Bonaire and is active on 160 to 10 metres. From 2005 to 2013, while living in Sabah, East Malaysia, Steve held the callsign 9M6DXX, while Eva was licensed at 9M6EVA. Eva was not very active on the air and mainly used the station to keep in contact with Steve when he was on a DXpedition. Nevertheless she worked some good DX from Sabah including 3B7C, 4W6A, 5A7A, S21XA, T32AJ, T32BJ, T32C, T32CI, T32MI, T32SI, T32VI, VK9DNX, VU7RG, VU7MY, XW8XZ, Z22JE and ZL8X. a quarter-wave inverted-L with a 22m high vertical section for 160m. My QSL Manager is Tim Beaumont, M0URX. Tim does an absolutely first-rate job as QSL manager and I can recommend his service with no hesitation. You can receive the QSL card pictured here by QSLing to Tim using his OQRS service, direct (with $2 and an SAE), or QSLing via the RSGB bureau. Please mark any bureau cards "via M0URX" or they will not get to me. All logs are uploaded to Logbook of The World (LoTW) on a regular basis. My QSL information and Tim's postal address etc can be found on the PJ4DX qrz.com page. I was first licensed as G8FEO in 1970 while at high school in England. I operated mainly on 2m SSB, sometimes working as G8FEO/P from high spots such as Woodbury Common near Exeter, or Dartmoor. On a few occasions I operated as GW8FEO/P from the North Wales mountains. My first HF licence was EP2SL when I was working in Iran in 1978 - 1979. ​After returning to England I upgraded to the Full UK licence and took out the callsign G4JVG in 1980. I have held this callsign ever since and, due to changes in the UK licensing regulations a few years ago, it is now a lifetime licence. In the 1980s I lived for several years in Stockholm, Sweden, and operated as G4JVG/SM0. For one year, 1986 - 1987, Eva and I lived on the island of Lidingö, just outside Stockholm. The island counts as EU-084 for the Islands of the Air (IOTA) programme. The photo on this QSL card was taken from the window of our apartment looking over the water towards Stockholm. and shows one of the large passenger ferries that cruise between Stockholm, Mariehamn in the Åland Islands, and Helsinki, the Finnish capital. During the 1980s I made frequent trips to the Åland Islands, from where I operated as OH0/G4JVG. In 1991 I took up a three-year contract in Papua New Guinea. We lived in Port Moresby from 1991 to 1994, from where I was active as P29DX. I also obtained the special short callsign P20A for use in contests. November 2000, the first edition of RadCom of which I was editor. For 10 years, between 1995 and 2005, I was a staff member of the Radio Society of Great Britain (RSGB). During this period I worked on RadCom and the late lamented D-i-Y Radio and Radio Today magazines, culminating in a period of four and a half years years as Managing Editor of RadCom. In 2005, Eva and I took early retirement and moved to Sabah, East Malaysia, where I held the callsigns 9M6DXX and 9M8Z. Eva was also licensed there as 9M6EVA. While living in Sabah I took the FCC exams and now also hold the US Amateur Extra licence KH0UN.